For some time now, I've been thinking about building a personal, portable Beowulf cluster. The idea began back in 1997, at a National Science Foundation workshop. A bunch of us attended this workshop and learned about parallel computing, using the latest version of MPI (the Message Passing Interface). After the meeeting we went home realizing we had no such hardware with which to practice what we had learned. 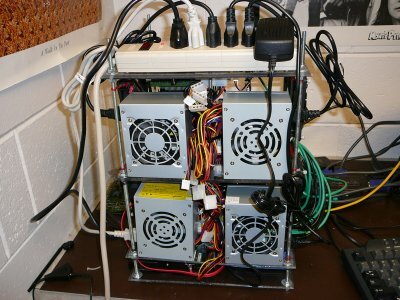 Those of us who were lucky got grants to build our own Beowulf clusters; others had to settle for running their applications on networks of workstations. Even with a (typical) multiuser Beowulf cluster, I have to submit jobs via a batch queue, to avoid stealing the CPU cycles of other users of the cluster. This isn't too bad when I'm running operational software, but it is a real pain when I'm developing new parallel software. So at the risk of sounding selfish, what I would really like -- especially for development purposes -- is my own, personal, Beowulf cluster. My dream machine is small enough to sit on my desk, with a footprint similar to that of a traditional PC tower. The system must also plug into a normal electrical outlet, and runs at room temperature without any special cooling beyond my normal office air conditioning. Gigabit Ethernet (GigE) became the standard on-board network adaptor. In particular, these two developments let me envision a small, four node system, in which each node had a multicore CPU, and each node communicating via GigE. As you can see the nominees for transportable Beowulf systems is short but distinguished. Let's move on to clusters that are gunning for the price/performance crown. There are more lower cost clusters that have laid claim at one time or another to being the price/performance king. As we'll see, Microwulf has the lowest price/performance ratio ($94.10/GFLOP in January 2007, $47.84/GFLOP in August 2007). than any of these. 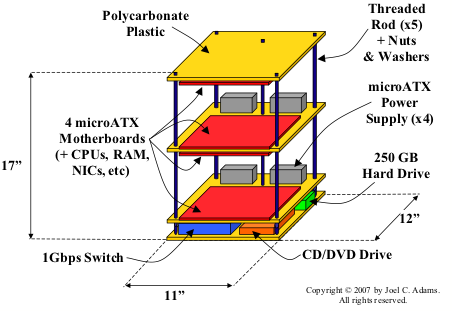 Microwulf is intended to be a small, cost-efficient, high-performance, portable cluster. With this set of somewhat conflicting goals, we set out to design our system. The basic idea is that there are three different ways to starve a computation: deprive it of CPU; deprive it of the main memory it needs to run; and deprive it of I/O bandwidth it needs to keep running. Amdahl's "Other Law" says that to avoid such starvation, you need to balance a system's CPU speed, the available RAM, and the I/O bandwidth. For Beowulf clusters running parallel computations, we can translate Amdahl's I/O bandwidth into network bandwidth, at least for communication-intensive parallel programs. 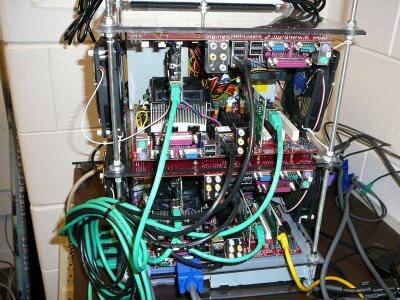 Our challenge is thus to design a cluster in which the CPUs' speeds (GHz), the amount of RAM (GB) per core, and the network bandwidth (Gbps) per core are all fairly close to one another, with the CPU's speeds as high as possible, while staying within our $2500 budget. With Gigabit Ethernet (GigE) the defacto standard these days, that means our network speed is limited to 1 Gbps, unless we want to use a faster, low-latency interconnect like Myrinet, but that would completely blow our budget. So using GigE as our interconnect, a perfectly balanced system would have 1 GHz CPUs, and 1 GB of RAM for each core. After much juggling of budget numbers on a spreadsheet, we decided to go with a GigE interconnect, 2.0 GHz CPUs, and 1 GB of RAM per core. This was purely a matter of trying to squeeze the most bang for the buck out of our $2500 budget, using Jan 2007 prices. For our CPUs, we chose AMD Athlon 64 X2 3800 AM2+ CPUs. At $165 each in January 2007, these 2.0 GHz dual-core CPUs were the most cost-efficient CPUs we could find. (They are even cheaper now - about $65.00 on 8/1/07). To keep the size as small as possible we chose MSI Micro-ATX motherboards. These boards are fairly small (9.6" by 8.2") and have an AM2 socket that supports AMD's multicore Athlon CPUs. More precisely, we used dual-core Athlon64 CPUs to build an 8-core cluster, but we could replace those CPUs with AMD quad-core Athlon64 CPUs and have a 16-core cluster, without changing anything else in the system! We equipped each motherboard with 2 GB (paired 1GB DIMMs) of RAM -- 1 GB for each core. This was only half of what a "balanced" system would have, but given our budget constraints, it was a necessary compromise, as these 8 GB consumed about 40% of our budget. To minimize our system's volume, we chose not to use cases. Instead we went with an "open" design based loosely on those of Little Fe and this cluster. We chose to mount the motherboards directly on some scrap Plexiglas from our shop. (Scavenging helped us keep our costs down.) We then used threaded rods to connect and space the Plexiglas pieces vertically. As can be seen in Figure One, we chose to mount the motherboards on the underside of the top piece of Plexiglas, on both the top and the bottom of the piece of Plexiglas below that. and on the top of the piece below that. Our aim in doing so was to minimize Microwulf's height. As a result, the top motherboard is facing down, the bottom-most motherboard is facing up, one of the two "middle" motherboards faces up, and the other faces down, as Figure One tries to show. (Jeff notes: These boards have a single PCI-e x16 slot so in the future a GPU could be added to each node for added performance).